Weighty Matters: Eating Well with Canada's Food Guide at McDonald's! Eating Well with Canada's Food Guide at McDonald's! Ever wonder how many, "Canada's Food Guide" servings you'll get from a Happy Meal? On McDonald's website is a handy dandy page called Canada's Food Guide Facts. It'll help teach you how the juice you order for breakfast at McDonald's is really 2.5 servings of fruit; how their refined white flour, processed cheese, red meat based cheeseburger counts as 2 servings of grain, 1/4 serving of milk and 1/2 a serving of meat; and how consuming Newman's own caesar salad dressing (with 480mg of sodium per tablespoon) helps you to get the recommended daily servings of unsaturated fats. Of course it'll also help teach you just how nutritionally weak our Food Guide is given how easily McDonald's can describe how well their food fits into it. 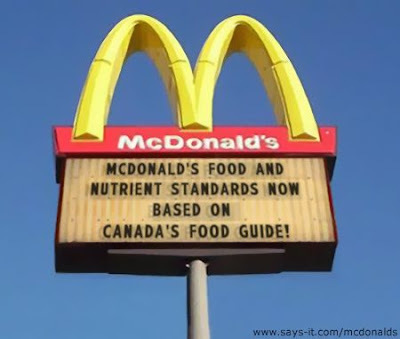 Certainly were there in fact stringent and evidence-based guidelines backing up the Food Guide, there'd be explicit limitations on such things as juice consumption, refined grains, red and processed meats and high calorie, high sodium salad dressings and likely no McDonald's hearts Canada's Food Guide webpage.